Sushi is always wrapped in nori sheets made from pressed and dried algae. But why don’t those sheets fall apart into single algae leaves? I suppose the secret lies in the high agar content of the algae. Agar is used for gelification and also helps to hold thin sheets together. Thinking about fruits and vegetables, they naturally contain a similar gelling agent. Thanks to the pectin content, jams made from fruits form a gel. Paté de fruits or fruit leathers are also bound together by the pectin. My idea was to adapt the technique for fruit leathers to vegetables – in this dish for green tomatoes and bell peppers, which also contain some pectin – and create thin sheets for wrapping sushi in them. The result was marvelous. The dried thin vegetable sheet resembled all features of the classic nori sheets, but with a different flavor. Just imagine the endless number of combinations and new possibilities for sushi-wraps! Another idea I used for the lechosushi were the texture of tomatoes and bell peppers. Half-dried tomatoes develop a similar consistency to soft meat and can be used perfectly for vegan tartars, which actually fool a lot of meat-eaters. Baked bell pepper not only develops a rich flavor, but also gets a slightly meaty texture. Both combined yield the flavor profile of a lecsó. So in the end it was self-evident to use half-dried tomatoes and baked peppers as the filling for the newly developed lechosushi. Above I mentioned, that I prefer my lecsó with rice. Since rice is a main ingredient for sushi, it was straightforward to use it in the lechosushi as well. I used less rice vinegar for the rice compared to traditional sushi recipes, because I didn’t have to balance the fattiness of the fish. Instead I replaced some of the vinegar by a reduced lecsó stock, which I cooked from all the leftovers from the half-dried tomatoes and peppers (such as skins, seeds and pulps). I also tried to substitute the traditional accompaniments of sushi by replacing the wasabi with a hot green pepper paste and by changing the ginger to onion marmalade. For the soy sauce I experimented with a deep brown onion sauce, but dropped it in the end, because it took the sushi into a different direction. Instead, I cooked a lecsó soup and reduced it to a slightly thick sauce, which enhanced the lecsó flavor even more. If you would like to taste this quite original and unique appetizer, come to Budapest on the 8th of September this year. The Hungarian Dining Guide invited me to their annual Blogger Tasting, where I’ll be serving these lechosushi along with Noémi from Almond Corner, who will prepare a classic Hungarian dessert in a different and new form. We’ll be behind the counter from 3 to 6pm on the 8th of September. The tasting will be held in conjunction with a 3-day-long street food show at the marketplace in the Hold street (Budapest, Hungary), where you can taste a lot of different specialties as well. So if you will be around, I’d be happy to see and meet you there! Blanch the green tomatoes and peel. Reserve the skins. Chop the tomatoes and transfer to a small pot. Wash the green bell peppers, cut in half and remove the seeds. Reserve the seeds and the stalk. Line a baking tray with parchment, add the bell peppers with their skin side up and bake in the oven at the highest possible temperature at the upper level until the skins pop and turn black. Remove the peppers from the oven and transfer to a small pot. Cover and chill to room temperature. Peel the peppers and discard the skins. Chop the peppers and add to the tomatoes with a pinch of salt and a pinch of sugar. Cover and cook over low heat until soft, stirring occasionally. Remove from the heat, remove the cover and allow the vegetables to steam .Blend the vegetables to a fine puree. Season with salt, but be careful not to salt too much, since the puree is going to be dried and the saltiness will get more intense. Line a baking tray with a silpat mat (30x40cm). Spread the puree evenly and not too thin on the silpat mat. Dry in the oven at 80°C / 175 F for 2-3 hours with a slightly opened door (e.g. using a wooden spoon). Remove the mat only when the sheet is completely dry. Carefully remove the sheet from the silpat mat. Chill to room temperature and keep wrapped in kitchen foil. Blanch 4 red tomatoes and peel. Cut the tomatoes in quarters and remove the stlak and seeds. Reserve the skins and seeds. Line a baking tray with parchment paper or a silpat mat. Peel and cut a garlic clove in very thin slices. Sprinkle the tray with (olive) oil, garlic, salt and pepper. Arrange the tomato quarters on the tray. Season with salt and pepper, sprinkle with some olive oil and dry in the oven at 80°C / 175 F until the tomatoes reach half-dried consistency. Carefully remove the tomatoes from the tray, discard the garlic and add the oil from the tray on the tomatoes. Cover and refrigerate. Wash 1 large pale yellow pepper, cut in half and remove the seeds and the stalk. Reserve the seeds and the stalk. Line a baking tray with parchment, add the paprika with its skin side up and bake in the oven at the highest possible temperature at the upper level until the skins pop and turn brown. Remove the peppers from the oven and transfer to a small pot. Cover and chill to room temperature. Peel the peppers and discard the skins. Cut the paprika in 1cm wide long strips, season with salt, cover and refrigerate. Wash the garlic head, sprinkle with some oil, wrap in aluminium foil and bake in the oven at 180°C / 355 F for 30-40 minutes or until soft. Chill to room temperature, unwrap and peel the cloves. Crush the garlic using a fork or a mortar and pestle into a fine paste. Season with salt and pepper. Cover and refrigerate. Peel and chop 1 large onion. Add to a large pot and sauté with 1-2 tbsp oil. Peel and slice 2 cloves of garlic and add to the onion. Wash 4 red tomatoes and 2 pale yellow peppers. Remove the stalk of the peppers and reserve. Chop the tomatoes and peppers and add to the onion. Stir well, cover and cook over low heat for 45 minutes. Press the stew through a food mill and discard the skins or any other leftovers in the food mill. Cook the resulting liquid until it starts to thicken. Season with salt, pepper and sweet paprika powder. Chill to room temperature, cover and refrigerate. Peel 1 large onion and 2 garlic cloves. Chop and add to a large pot. Add all reserved leftovers, such as tomato skins or pepper stalks. Cover with water. Cover the pot with a lid and bring to a boil. Cook over low heat for 45 minutes. Chill to room temperature (still covered). Strain the liquid and cook until reduced to about a quarter of the original amount. Chill, cover and refrigerate. Using a blowtorch burn the skin of the hot green pepper. Scrub the skin from the flesh under cold running water. Discard the stalk and the seeds. Grate or blend the pepper. Cover and refrigerate. Add the sushi rice to a bowl and wash with cold water until the water comes off clear. Strain and leave for about 1 hour. Bring 280ml water to a boil (covered). Add the rice and bring to a boil while stirring continuously. Reduce the heat to the lowest setting, cover the pot and cook the rice for 10-15 minutes. Remove the pot from the heat and leave covered for 15-20 minutes. Mix 25ml lecho stock with 1 tbsp rice vinegar, 1 tsp sugar and 2/3 tsp salt. Transfer the rice to a wooden or ceramic bowl (don't use metal!). Pour the liquid over the rice and lighten the rice with a fork. Meanwhile chill the rice by waving it with a fan. When the rice reached room temperature, cover it with a clean towel. Remove all ingredients from the fridge and allow them to reach room temperature. Unwrap and cut a green sheet in 3 rectangles. Wrap a sushi mat in kitchen foil. Put 1 tomato-pepper sheet on the sushi mat with its smooth side up. Add some sushi rice on the sheet evenly with wet hands. Put 2 1cm wide baked paprika strips and 4-5 half-dried tomatoes on the middle of the rice. Season with some garlic paste and "wasabi" according to your taste. Roll up the sushi tightly, transfer to a cutting board and cut into 9-11 pieces using a wet knife (11 pieces if you discard the two ends). 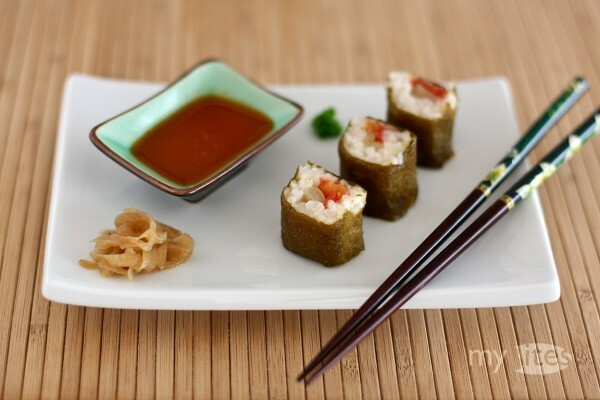 Arrange the sushi on plates and serve with some lecho sauce and chopsticks. Thank you, Angelika! Sometimes you just forget about an idea and it suddenly pops up in the right moment when pondering about a different recipe. These creative processes are so wonderful: it’s so much fun to create something new – and even more relieving if it turns out really great.